A lion-tiger hybrid cub at a wildlife park in China's southernmost island province of Hainan died of respiratory failure 72 hours after birth. The lion-tiger cu b, born Sunday to four-year-old tigress Huanhuan and 2.5-year-old lion Xiaoerhei, was found breathless at 3:00 a.m. Tuesday and died at 6:00 a.m. despite emergency rescue efforts from the vets, Guo Hongzhe, a supervisor of the tropical wildlife park on the outskirts of the provincial capital Haikou, said Thursday. A local zoologist attributed the young animal's death to breathing difficulties caused by congenital respiratory failure. "There's nothing strange for the death as hybrid cubs of lions and tigers tend to have poor immunity and seldom survive," said Dr.Li Yuchun, deputy dean of the biological department of Hainan Teachers' College. Li said only one out of 500,000 lion-tiger or tiger-lion cubs could survive, due to differences in their chromosomes. 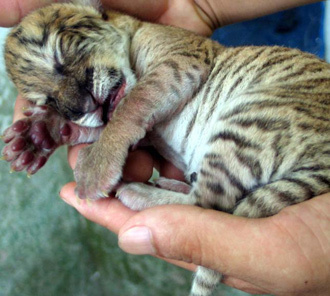 The cub was the first "liger" ever born in the island province and was born underweight at 600 grams, said Guo. Its tigress mother Huanhuan had completely ignored her baby and refused to cuddle or feed it. Zoo workers had to find a pet dog who had just given birth to suckle the cub, hoping the antibodies in the colostrum would help enhance the liger's immunity. After its death, the park management has preserved the liger's body in formalin for further research. "We won't give up," said Guo. "There's still hope for more ligers to be born in the park." According to the park supervisor, the cub's mother Huanhuan entered oestrum nearly every month since she started to share a pen with her lion lover Xiaoerhei, sometime in April 2003. "She might have another oestrum in two months and if she becomes pregnant then, we may expect another liger by the end of this year." The gestation period for tigress is around three months, but the pregnancy rate for tigress and lioness is as low as 1-2 percent, Guo said. The two species, though both felids, cannot mate in the wild owning to different living environments and interbreed very rarelyeven when kept in captivity. China's first tiger-lion hybrid cub was born at Hongshan Zoo inNanjing, capital of east China's Jiangsu Province, in 2002. But itdied a week later. A lion-tiger, or liger, was born in September 2002 and lived for more than 100 days at a forest park in Fuzhou, capital of Fujian Province. Only eight to 10 lion-tiger and tiger-lion cubs are living in the world, according to zoologists.